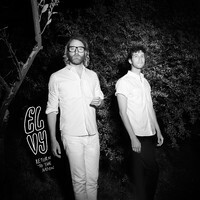 EL VY is a new collaboration between The National’s Matt Berninger and ex-Menomena man Brent Knopf. We met up with the duo to discuss the roots of the project and to hear how Minutemen and the musical 'Grease' helped inspire their debut, Return To The Moon. So you guys met when The National and Menomena toured together, 12 years ago, right? 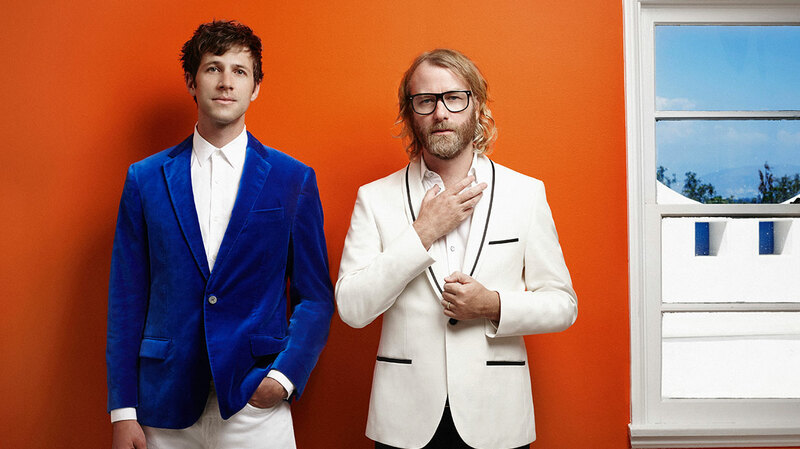 Matt Berninger: The National and Menomena became pals at that show, and then we ended up doing lots of tours together years later and have always stayed friends. Brent came to our show in Portland about six years ago, and after the show, drunkenly off the cuff, I said to him, “If you ever have any stuff that you’re not using for Menomena or Ramona Falls, send me whatever leftovers.” He sent me 450 ideas in a folder and, over the next couple of years, I would keep going back to that folder, pull things out and put them into another folder that I called “The Moon.” I’d work on little things in GarageBand, while on tour with The National, but without any real idea that it was gonna turn into a record. Does writing music with no plans to release it make you more adventurous in the creative process? BK: Yeah, because you’re just having so much fun, right? To answer your question, I think the fact that this didn’t have to happen, that there was no schedule for it, and that both of us weren’t putting any pressure on it, informed the creative process because it was allowed to be reckless and under-thought. I would send Brent a bunch of ideas, or vice versa, and maybe not hear anything back, other than, “Hey, thanks, these sound great.” Many, many times it was like, “Maybe that just died on the vine a little bit?” which was ok. I’m glad it didn’t though. Songs are the only place where ugly feelings and embarrassing experiences are welcome. When you first discussed making music together, was there ever any talk of what form that music might take? BK: I think we were looking for an opportunity to spread our wings a little bit, you know? But we didn’t really predetermine it, or put too much forethought into how it should actually sound. And, actually there’s a pretty wide variation in how each song sounds, relative to the others. But we did, every now and then, share a little tune that inspired us, like, “Hey, this song by Love And Rockets is really cool: whatever vibe they’re creating is really fun.” So we would talk about it less aesthetically but more like how a song would make us feel. MB: Or I would send you a Minutemen song but not in terms of “Let’s try to write songs like the Minutemen,” (which is impossible to do because they wrote punk songs, they wrote jazz songs, they wrote acoustic ballads) but because they were not pigeonholing themselves in any way, and that was inspiring. There would be details, like D. Boon’s guitar or Leonard Cohen’s keyboards or something, but we didn’t have any overarching ideas on this record, really. It was a case of us chasing the songs where they felt like they wanted to go. When did you begin working intensely on Return To The Moon? BK: The super-intense work probably began in October, right? When you came up to Portland and we recorded some drums with my friend, Drew Shoals. I think as soon as we were in the same room it felt like it was going to happen and then, by tracking drums, we were bringing in another person into this project so we realised it was for real. MB: Months would go by between our emails to each other, but eventually we’d built this folder up and, when The National finished touring for Trouble Will Find Me, we decided, “Let’s finish this.” 80% of the work was done in the last year. ‘I’m The Man To Be’ was the last thing that happened, and it was this reckless thing. And when I say reckless, I mean that in a positive way. We weren’t trying to curate or edit ourselves, and at the end we turned off our... What did we call it? BK: Our editing brain. There was no time to over-think something. How did you find working together? Were there any disagreements? BK: Every now and then we’d have a difference of opinion, or we’d talk about a section that wasn’t working, but, for me, the vibe stayed incredibly positive. And neither of you were at all precious about any of your ideas being reworked? BK: I think everybody gets a little bit precious about some stuff, right? With ‘I’m The Man To Be’ arriving really late, putting that song on the record meant killing a couple of other songs that we had spent thousands of hours on. I’d be lying if I said there wasn’t some sort of emotional component to work, but that’s one thing I really learned working with Matt: you have to follow the best ideas. You have a brief period of mourning and then you move on. Can we talk about the lyrics, Matt? There’s a loose love story running through the album, right? MB: There is a love story between these two characters, but it’s got a lot of loose ends, and there’s a little bit of a cliff-hanger at the end. But, yeah, there’s this character Didi Bloome and this character Michael, kinda based on D. Boon and Mike Watt from Minutemen, but not so much about them starting a band, more about their friendship. And then my daughter has been watching the movie ‘Grease’ a lot, so when I was writing the lyrics I think there was a little bit of this Danny and Sandy sort-of relationship happening between these two characters. There’s a weird mixture of me channelling real characters, channelling myself and also channelling fictional things. Return To The Moon features a lot of autobiographical detail about your adolescence. Why was that period a preoccupation? MB: I think I was thinking a lot about how I became the way I am, maybe. How I discovered music and what it was like being a kid in Cincinnati and finding your identity through music, I guess? Coming out of the mush of what you are as a child to the moment you realise, “This is the type of person I am – this is what I’m connected to and I’m not alone in the world.” Some people will find their tribe with sports or something, but for me it was music. There are bits and pieces of real things from my childhood and adolescence, but then again a lot of it is an invented collage of a story, of not just me but of other people I know. You reference The Jockey Club in ‘Paul Is Alive’. Did you ever go? MB: No, it closed before I was old enough to go. It was this punk club in northern Kentucky, across the river from where I lived, and my older cousin Peter would talk about it. He saw The Ramones and Black Flag and The Smiths there. In my brain, the idea of Joey Ramone or Morrissey walking the streets of Cincinnati, Ohio, seemed like an impossible thing; I described it as like seeing a unicorn in your backyard. It was one of the only places in the mid-west that was this little oasis where the punk club bands could get a gig between other gigs. I would go to this place called Cooter’s, on Sunday nights from eight ‘til midnight, that would have alternative music. They would play Bauhaus and Ministry and The Cure and The Smiths, and we could dance to that. That’s where I would wear my combat boots and trench coat and bad haircuts, and that’s where I met my friends. So The Jockey Club became symbolic of all the places where I met friends. Where did you go out when you were growing up, Brent? BK: My family is very wholesome so I wasn’t really allowed to buy any records that were secular until I was 12 years old. And then I bought Depeche Mode and Sting, or something like that. That was very risqué. It was The Soul Cages, actually, which I think is still a great record. MB: It is a great record. BK: So before I was allowed to buy those records, I was listening to instrumental music because there are no corrupting lyrics. I was very into the theme song from the ‘Beverly Hills Cop’, ‘Axel F’. But I grew up in the countryside, right? So the summers I would pick berries and throw hay bales under pick-up trucks as summer jobs; it’s not like I was in a metropolis where there were nightclubs. Me listening to Depeche Mode made me the weird kid already. The first club I went to, I remember I saw Oasis on their Definitely Maybe tour. I think I was a junior in high school. MB: Where did you see them? Why did you choose to revisit these formative experiences with this project, rather than with The National? MB: I don’t know. It probably has to do with the fact I have a six-year-old kid and I’m seeing her become herself. Specifically, watching her being obsessed with the ‘Grease’ soundtrack. I was obsessed with the ‘Grease’ soundtrack as a kid. I stared at Olivia Newton John for uncomfortable amounts of time; I was in love with her. And now I see my daughter finding her identity, not just with that, but with other things. I see her becoming herself – becoming an individual – and it made me think how did I end up how I did? What were the factors? Maybe that’s why I was digging back into my adolescence and youth a little bit. Do you think if you had been writing a record with The National at that time instead, that record would have explored similar themes? Or was it something about the context of this project, with there being no expectations? MB: I don’t know. Lyrics usually come from whatever mental soup is going on at the time, and most of them were written in a small amount of time last year. I was listening to a lot of Minutemen – obsessed with their documentary ‘We Jam Econo’ – so the stuff that is in the lyrics is just what was in my head. If I’d been working on a National record, maybe all of that stuff would have ended up in there instead. But it’s not like I have a folder where I keep some ideas for one project and some ideas for another. On ‘Paul Is Alive’, you sing “Beatlemania made my mother think the way she does.” Do you believe that music shapes identity? MB: Yeah, definitely. I think I learned to process and accept myself, and be curious about myself, through Morrissey and The Smiths and R.E.M. and Leonard Cohen and Nick Cave. When you connect with music, obviously you’re connecting on a visceral level of entertainment, but I think the real connection is you connecting with a human being who’s saying honest, ugly things about themselves or their feelings. Songs are the only place where ugly feelings and embarrassing experiences are welcome. It makes you feel comfortable with yourself by hearing other people’s experiences. The whole thing about Beatlemania is just a way of saying this is how people of the last several generations have broken out of the chains of the societal pressures of how to be a normal person, whatever that is. Rock music allows people to dig into all the awkward, uncomfortable realities of what it is to be a human in the world, in a very direct, very fun, very visceral way. It connects better than movies or novels or sports; rock music is a mainline right into souls and stomachs and hearts. BK: Not exclusively rock music, but rock music for us.